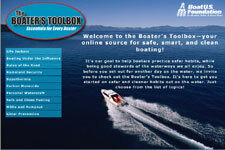 Boaters can now improve their boating knowledge with the new "Boater´s Toolbox," a web-based learning tool offered by the BoatU.S. Foundation. The "Toolbox" features in-depth information on 10 of the most popular safety and environmental issues affecting today´s boaters. The topics featured include: Life Jackets, Boating Under the Influence, Rules of the Road, Homeland Security, Hypothermia, Carbon Monoxide, Personal Watercraft, Safe and Clean Fueling, Marine Sanitation Devices and Pumpouts, and Litter Prevention.